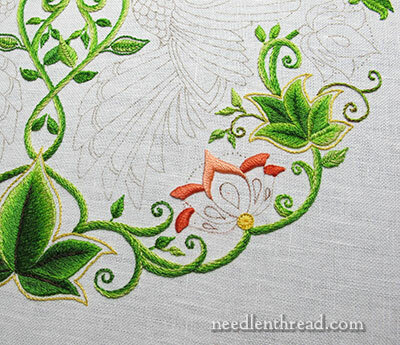 I have a hard time letting go of something that’s nagging me on an embroidery project. If it’s nagging me, I want to tackle it and correct it right away; otherwise, it hovers like my own personal little grey cloud, detracting from the rest of the embroidery. And that’s what was happening with the outer outlines on the leaves on the Secret Garden Project. They were bugging me. I had determined to leave them until later. But there they were, hovering. Nagging. Whispering. Constantly distracting me. After eight failed attempts at settling on a color and a stitch for the outer leaf outlines, in steps an email from Margaret Vant Erve (if you’re not familiar with her embroidered landscapes, you should be!). She suggested one of two options: a dark maroon or a mustard yellow. I had already tried a maroonish color, but yellow – yellow never occurred to me at all! Even though this cluster of leaves was not quite finished, I thought I’d test yellow. At first, I tried a brownish-goldish-yellow, which is what I think of as a mustardy yellow. It didn’t really Spark. Then I thought, “Why not try the yellows I already have in mind for this project?” And so, I took the medium shade of the three yellows I’m using on the project, and tried it out. It’s a springy deep yellow – a little brighter, perhaps, than a jar of French’s Mustard. But definitely yellow. When I first tried it, because it was yellow and seemed bright-but-not-visible, I thought I’d try a more textured stitch than the stem stitch. So I worked an outline segment in coral stitch, in Palestrina stitch, and in Portuguese knotted stem stitch. And then I picked them all out, and worked this section of the outline in stem stitch. And I saw that it was good. It was good. It was… GOOD. I leapt from my chair! I jumped! I frolicked about! I rolled about on the floor amidst rivers of yellow embroidery floss! I Reveled in Yellowness. What I like about it is… well, everything! It’s there – it’s an outline – but it’s not Boldly There. It doesn’t detract. It’s bright yellow, so it contributes to the springy, lush effect of the leaves – kind of like a glowing halo around them. It blends while accenting the green. And that is why 15,000 heads are better than one. In the scheme of things, the yellow definitely works. There will be quite a bit of yellow on the flowers, too. In the photo above, you can get a sense of the first splashes of non-green color. The base of the flower is yellow, and on this particular flower, all the tear drops will be yellow, and the stamens that will come out of the flower like a fan behind it will also be yellow. 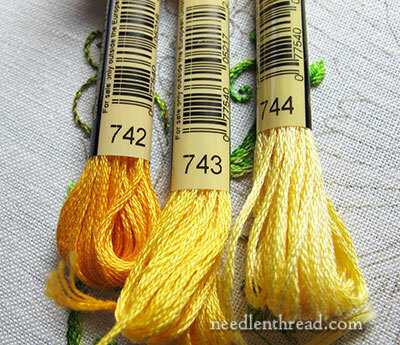 The DMC colors of yellow that I’ve picked out for the project are 742, 743, and 744. I’m using 743 as the outline color. Even though I started a flower, I’m still plugging away on leaves, too. Later on, we’ll look at the flower up close and we’ll talk a little more about leafy things. And now, I’m off to buy a yellow car, paint my house yellow, paint my room yellow, buy a canary, and eat bananas and lemons until the end of my days. Me, too. What a relief! I woke up this morning chomping at the bit to get out there and stitch! The last couple days, it was drudgery. Once that yellow went in, life was beautiful again! Sense of humor?!! You mean, you think I’m kidding about the yellow car? The house? The bananas?!?!?!?!? Actually, I am definitely kidding about the bananas. And come to think of it, about the yellow car, too. You know, we actually DO live in a yellow house! Not kidding! And oh, yeah, I hate bananas, too. 😉 But lemons are good. Especially lemon-flavored deserts and candies and the like. And oh lemon poppy seed bread, how I crave you. Those are my favorite yellows to match my optimism anyhow and your outline solution does provide the sparkle or halo for this new project. Happiness! Indeed. It just lifts it all up! Thanks, Chris! LOVELY! I wouldn’t have thought of yellow either but it looks terrific! I’d have automatically thought it needed to be darker for an outline, so I’ve learnt something today! Thank you! Yes, me, too, Anne. I thought dark, too – and I even tried a dark maroon, because in ecclesiastical work, goldwork, etc., maroon outlines make things pop. But they didn’t work here, and I was really beginning to wonder about the whole concept of the outlines, before trying the yellow. So much happier with it! Oh Mrs. Corbet… IT’S PERFECT! I didn’t think of yellow, because I’m up to my neck in it for two embroidery projects. I love yellow! It works for all the things you brought out, and the flowers are going to look positively DREAMY! I want to jump up and down and do a happy dance with you. I’m just going to sigh happily now and look at the pretty photos. Thanks, Kristina! I’ll leave the dance part to you. If I were to do a happy dance – I mean, a real happy dance – it would be somewhat reminiscent of Disney’s Fantasia. Kind of like this: https://www.youtube.com/watch?v=nEjPDS8Jp1E LOL! Bother, I was hoping you could do it for me, because I can’t happy dance anymore. Hip dysplasia. Then we’ll just do it metaphorically. Though I do admit, I did take a little skip! I Suppose that will have to do. Is there going to be any blue in this version? And I seem to be craving Lemmon Bars, and Lemmon meringue pie! I know you’re probably sick of hearing from me, but I had a thought as I was stitching today. I thought, “I wonder if I was doing the Secret Garden project if I would have chosen a more “gold” yellow.” This design and indeed most of the designs in the book remind me a lot of Indian Jewelry designs. Then I thought, “Gold, Goldwork, no DO NOT even go there.” But alas, I did. Now I’m imagining these jewel-tone colors set in sparkly gold. I just had to get that off my chest! Ug! I understand what you mean about stitching on black. Right now I have to stitch black thread on a black outline. NEVER AGAIN! Yes, I can’t help thinking of goldwork outlines when combined with silk embroidery … or metal thread embroidery in different colors of metal threads… I know. I know. We can’t help it. OMG! Your yellow is fabulous! It brings the whole thing to life and just glows! Ahhh, good! Then we all agree – yellow is IT! Thanks, Paula! Watching you go through the process is inspiring and informative. There are so many steps and considerations I won’t have to futz my way through because you’ve forged through them first. Our tastes seem to realy run together on this project and I am enjoying watching you go through the process very much. Thank you for letting me sit on your shoulder as you go along. I’ll be eagerly watching for the next post. I seldom comment, but I had to chime in and say – I LOVE the yellow. I’m planning on doing this project (eventually! ), and I did not like the outlines at all. I was planning on either leaving them out, or stitching the leaves all the way to the outline. Now? Love them! Margaret Vant Erve is a genius!! Thanks, Kelly! Glad you chimed in! I really did have a time with the outlines, so yes, thank you, Margaret! It was an ingenious idea! I don’t think that I am very good at selecting colours and this just proves it. I liked all of the previous outlines you showed but now that I see how the right colour can really really make a difference. The yellow is like a halo that highlights the leaves rather than over shadowing them. Well done, Margaret! And I agree with Mary, your website is worth visiting or even revisiting, as I just did. Your embroidery is very beautiful! Thanks, Carol-Ann! By the way, this: http://threadsacrosstheweb.blogspot.com/2014/03/the-final-furlong.html is absolutely stunning! So mesmerizing! The yellow is perfect! It just, fits. Hm, now I’m back to thinking yellow for my office walls…. Margaret’s idea is brilliant! Just perfect! I would like to know where she lives so I can buy the house next door so she can give me daily color advice! the yellow is Perfect! It looks lovely. Mary, your embroidery is lovely – so inspiring! 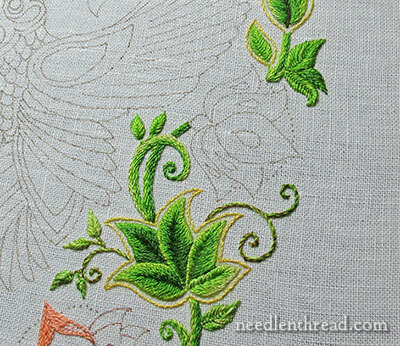 I love the swirls and curls, and the yellow outline stitch, while simple in nature, adds just a bit of spark! 1st post since starting to read your blog about 4 years ago!! Mary, thanks so much for this post!!! It really brought me great mirth and joy just imagining you rolling about on the floor amid the yellow floss!! As I live in Australia, and it is nearly bedtime, you will “see” me falling asleep with a big grin on my face! Thanks for your blog Mary. You have so encouraged me to start embroidering. Without you and your advice so freely given the courage to start would have stayed a dream. Thanks from all of us who “camp” on your blog! Wishing you a lovely bright sunny day! The thing that amazes me the most is that you’ve made 37 cent DMC floss look so much fancier! I wish I could do it. I have to say I was never really in love with those outlines from the get-go. I would have left them off entirely, but then I would have been wrong. The yellow works! And now I can see how that outline really adds to the look. I’m glad I withheld comment until I saw what you decided to do with them. So glad you solved your dilemma! No, not the outlines, they are perfect, Margaret IS a genius. No, not your post. It was superb, I think it’s the happiest post I’ve ever read and put a smile on my face… for awhile. Then… so disappointing… you didn’t roll on the floor amongst the yellow thread. Oh, I was so sad, I had that pictured and was so enjoying it. And… you don’t like bananas. Yup, Mary, a big disappointment today. Oh dear. I should qualify – I like bananas IN things – sliced in yogurt, baked in stuff…but when I think of biting into a raw banana just out of the peel, my gag reflex kicks in. I don’t know why that is! No, no floss rolling yet. Some day, though – you never know! Really, think of it (assuming someone else had to pick up and untangle) – wouldn’t that be fun? Teehee. Mary…the yellow does add just the right touch when outlining the big leaves! I love it! Did you use one strand of yellow floss — like you used one strand of green floss to outline the little leaves — or did you stay with two strands of floss? Oh, lovely! So glad that worked out for you. Congratulations and celebrations you’ve found the solution the outlines look wonderful. I love yellow and yes I had yellow walls once and a yellow kitchen but alas not a car as I don’t drive only drive people mad, I wish I was there to dance and swirl around the floor with you, now the nagging and whispering is over. It’s so satisfying when you find the solution to a needlework project, You’re not a dolt you’re a very talanted lady and the project looks beautiful, thanks for sharing your solution to your dilemma. Yes!!!! I totally agree! Yellow is the sunny, spectacular solution! It’s wonderful…I’m so glad you did this. I also thought that some other color than green would be right the outline, but I figured you should leave it for last and then you’d ‘find’ it…it looks like you’ve discovered it already… Thank you Margaret for your great suggestion! Love, love, love it. Dr. Oz recently said everyone should have some yellow in their lives. You’re right on trend! Congratulations on finding the right color! I really like the yellow. It defines the leaves without being obtrusive. Mary, I really love the yellow. It makes those leaves just pop and come to life. A stroke of genius! I just had to comment that I absolutely adore the way you express your enthusiasm. I really enjoy reading about your small triumphs in needlework. Can Margaret please comment on why the yellow color works in this case. And “let there be yellow”!!! As much as I DO like yellow, and it IS the perfect solution to you piece — I had a mother that was in love w/ yellow and (no joke) we had a yellow house (inside and out), yellow car, yellow carpeting (uhhhh “gold”), and so on. So when you plotted your yellow future, I sort of cringed!!! Heh heh heh! I have a yellow kitchen, actually. It’s kind of a Provincial yellow, with white and red… But it’s definitely a LOT of yellow! The yellow reminds me of the day or two in some springs, when the sunlight is just right, and the trees are just starting to leaf out. On those special days, trees seem to glow a delicate yellow-gold. And that’s what your yellow outline reminds me of. I’m sending you a metaphorical bunch of Daffodils, Mary. Blessing!! and thank you!thank you!I did a happy dance myself last night….I followed your tutorial for long and short stitch and achieved an almost perfect complex leaf. As a newbie, I have tried really hard to resist,but you have enticed me with these glorius photos, I have thrown in the towel and caution to the wind. Fabric and book arrived yesterday. My only fear are these evertite frames. I have a crewel piece on the 18″ frame, I am short, as a result I am struggling to reach parts of it to get the stitch direction right, have it on the NSF4 and am hunched over it. Does anyone else experience this problem, could just be ignorance on my part, I would value some advise, I love those frames, ordered several sizes and paid a small fortune for shipping etc to Sydney. super§ je trouve cette idée formidable! Great solution! So pleased you finally figured it out. I’m exactly the same way when something is bugging me … can’t let it go until I’ve sorted it! 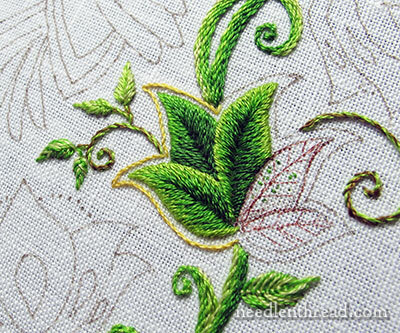 The precision of your stitching is amazing. Beautiful. Following your guidance I discovered the satisfaction of stitching stem stitch (can I do the whole piece in stem stitch?). And finally I’ve mamaged to stitch a single leaf in long and short, viewed from a little distance, that I’m almost pleased with. Thank you for your clear and careful guidance. Can’t wait to see what you have planned for the hummingbirds. The yellow is perfect! Light green was too much green, and dark green was too heavy – this is just right. I look forward to your posts on this project – more exciting than any TV serial. The yellow is just perfect…and I think when you have added other yellows to your other elements, the yellow outlines will help pull the whole design together! Yep, you nailed it. Love it. Have always loved yellow in general. AH Yellow! I LOLed when I ready your piece!! Im sure we all know how you feel!!! and Dance you should!! I am back to needlework after a lengthy absence!! Life, Kids, etc.. But after over 20 years my fingers started itching to get back… I have done embroidery, needlepoint, bargello blah blah. but nothing for years. getting back is fun but there are so many new threads and THINGS!! I actually walked into an uppity needlepoint store and asked where they kept their needlepoint wool and the response I got was… Picture a nose up in the air “OH NO one uses THAT anymore” Ummm Ok sorry,,,, what do THEY use.. Well we have silk and ivory and blah blah blah.. REALLY give a girl a break haha but I love embroidery, do they every call it crewel anymore ! I dont know now what anything is called.. Ok im cracking myself up sounding like a dolt!! Anyway, Love your site, and your work and hopefully Ill be able to pick something to do and get a move on!! Hi, Linda! Welcome back to needlework!! I had a good chuckle over your comment. Why is it that so many people have similar experiences when they go into needlework shops? It always puzzles me, to hear of “uppity” receptions for new customers at needlework shops (and I hear it a lot!). The market always being a rather tenuous one, I wouldn’t think shop owners could afford to that approach. People do use needlepoint wool today, though one of the more common ones available 20 years ago (Paternayan) went out of business for a while. It’s been recently resurrected, though, I believe. Needlepoint (also called “canvas work” now) has taken on a whole new look, with the introduction of all kinds of fibers and blends, and textured stitches, beads, colored canvases, and whatnot into the mix. But it’s still needlepoint! We do call crewel embroidery “crewel” still – referring mostly to surface embroidery done with crewel wool – and it’s enjoying a bit of a revival these days, methinks – although there are some new twists to it, too, like combining different fibers (silks, metals, metallics, and so forth) with it. Still, strictly speaking, “crewel work” is done with crewel wool. Oh, think of the fun you’ll have rediscovering needlework! A lot has changed in the past twenty or so years – new fibers and fabrics, a wider availability of fine embroidery supplies, a surge in the needlework “tool” market, etc. Counted cross stitch probably still dominates the market in the US (most needlework stores in the US are either counted cross stitch or needlepoint or a combination of the two), but surface embroidery is becoming more and more popular these days, too. So there’s lots to discover! And I’m sure you’ll have a blast exploring and discovering it all again! Hello Mary, I am a little behind in reading your postings. Just reading the beads and embroidery book review you gave. I have Yasuko Endo first book for ages now and have now got the second one. I just love them as I have your Lavender Honey the first thing I thought of when I saw Yasuko’s book was Lavender Honey and did the bee hive you have and put yellow beads where you have yellow stitching. I do love all of Yasuko’s of course some more than others and I do like the lace white work. Now Secret Garden. I do like the yellow outline it softens the work up. Thanks for sharing. I better away and read the rest of the postings. I’m learning so much from your blog! Just a small question: what needles are you using for the Secret Garden project? I’m still figuring out which needles to use for what project. Thanks for all your inspiration. I’m a real fan but this is off the subject but I don’t know who else to ask. Just recently got stung real bad on a punch needle and I don’t know who to ask for perhaps a list of the best or best two or three. I lost mine some time ago and bought another which looked good…RONG!! It was terrible. Can you or someone who does punch embroidery help me please? Just worked the outline around the lower set of leaves and yes it is really lovely, just like a halo. I am enjoying this project so much even though I have been a stitcher for many years. It brings the world of embroiderers to my home here in Swansea, South Wales, UK. Thank you your site is a great encouragement.